This summer we welcome back Sam Reese, our favorite soon to be senior at St. Francis High School way out in Wheaton, and the newest member of our team, TJ McCabe, a sophomore at MSU in Bozeman. They each had a spectacular trip after finishing up school, and have each shared the following posts and pictures. If you have not met them yet - please make sure to do so at your next visit! My Dad grew up in Sacramento California only thirty minutes from the town of Auburn and two hours from Lake Tahoe. Ever since I got him into flyfishing we’ve gone back to fish the Tahoe area time and again often looping our fishing excursions in with family get togethers and vice versa. 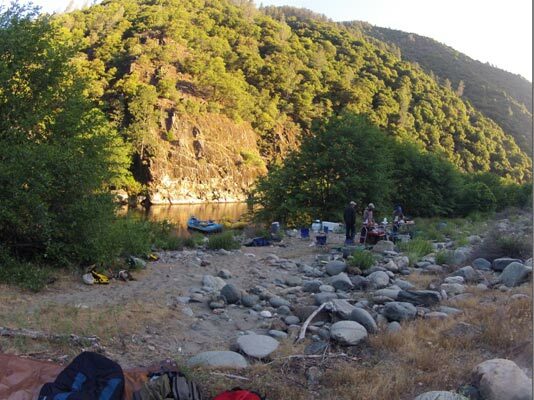 With summer 2012 quickly approaching and no trips planned we decided to take a look at doing a trip we saw on Mikey Wier’s blog about a year ago on the Middle fork of the American River. The Middle fork is primarily known for it’s whitewater up to class 6. 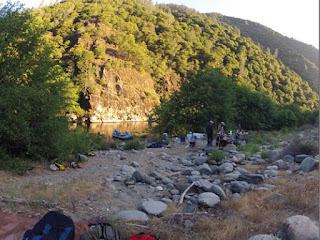 Starting only two years ago, Wilderness Adventures out of Auburn California, started doing two day guided whitewater / fishing trips down a sixteen mile stretch of the river and they are the only outfitter currently booking fishing trips down this section of river. 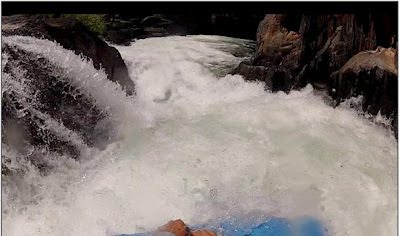 The first day includes all of the heavy whitewater including Last Chance Rapid (class III), Tunnel Chute (class IV+), Kanaka Falls (class IV) and many other rapids. As required by California law two boats are taken on the trip, one outfitted with seats and a frame accommodated for fishing and the other with the ability to hold one fisherman in front and the rest of the space for gear. 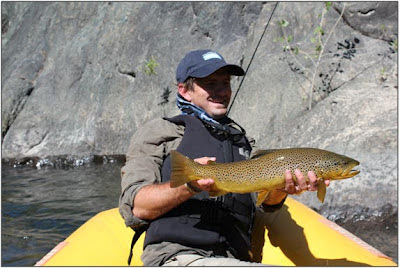 This trip is recommended for people who are up for running heavy whitewater and have a good deal of fishing experience who can manage tying on new leaders, tippet, flies, and untangling their own rigs, the guide is usually busy on the oars. He can point and tell you where to fish but that’s about it. Also being able to chuck big streamers on heavy sink tip lines is key to fishing this river effectively. There can be some good dry fly fishing in the evening and early mornings but most of the day is spent chucking big streamers on heavy sink tips with a six to eight weight rod depending on wind conditions. The water is swift and being in a raft, you only get one shot at most spots as you pass by. A lot of the time you are casting as close as you can to the bank and then letting the fly swing through as you give it some action. This method was used a lot during the trip. In the Middle Fork there’s also many deep holes in between rapids that are mostly too deep to even reach with the heavy rigs we had. The most productive parts of these holes were the tail-outs where the water got shallower right before the next rapid started. Tail-outs of major pools are where most of the big fish of the trip were caught. After a day of fishing and rapids, camp is set up at one of two great fishing holes. There’s some walk and wade fishing to be had after camp is set up and while dinner is being prepared. We ate some great food prepared by our guides and then talked fishing and told stories into the night. Since I’m a kid from the suburbs I don’t get to sleep under the stars very often. The decision to go tentless was a good one and it turned out to be an incredibly cool experience. The stars were brighter than anywhere I’ve seen. 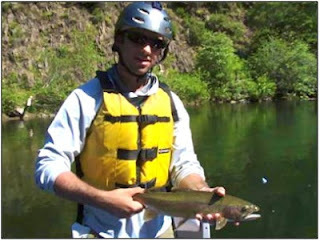 The second day doesn’t include much whitewater but has excellent fishing. Our biggest fish and greatest number were caught on the second day. It’s worth mentioning the species of fish that we saw on this trip. 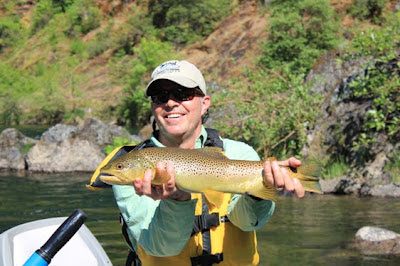 Almost all the fish caught were rainbow trout, but when we hooked a brown, the fish always was over twenty inches. This river may not have the population of some acclaimed trout rivers, but the fishing proved to be very consistent with a good chance of hooking into a monster brown. I didn’t get mine this trip but my dad and Mikey did. I did catch more rainbows than I could keep track of, some up to 20 inches. Even though I didn’t catch a big brown, because of the crystal clear water I got to see some chase after my fly. One of the coolest things I’ve ever witnessed in my fly fishing career had to be on this trip. I swung my fly down this bank and watched two massive brown trout follow it into the current and fight each other over who would take it. The biggest fish prevailed opening his mouth in a sweeping slash at my streamer. The big brown missed the fly, saw the boat, and was gone in a flash. The clear water that allowed me to see that event also resulted in spooking the fish. I stood there with my rod in my hand and stripped in line coiled around my feet, I couldn’t complain, seeing big wild trout behave like that was an experience unlike any other. A huge thanks to my dad for making this trip possible! 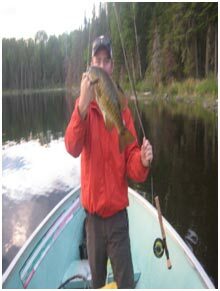 I also want to give a big thanks to the guide service Wilderness Adventures www.wildrivertrips.com and our guide Grady Garlough. This is a place where having a good guide is a necessity more for the whitewater than anything else but Grady ended up being one of the best guides for fishing I’ve ever had. He kept the boat going and made it possible for us to hit the best water in the most effective way possible. Thanks Grady for getting us into some fish and keeping us in the boat through the bumpy stuff. Another thanks goes to Mikey Wier. As with Mikey, my Dad and I enjoy finding trout in some harder to get to and out of the way places. For us the Middle American was a lesser known river that looked to have huge potential and some crazy looking whitewater, we were in. It’s a cool thing at my age to be able to hang around and fish with someone I look up to in the world of fly fishing and Mikey made that happen! I spent a week fishing for Northern Pike, Walleye, and Smallmouth Bass at an outpost associated with Canada North lodge on Little Women Lake, Ontario. The outpost was small, held 6 guys and had the typical Canadian outhouse. 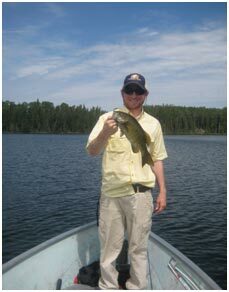 The weather was not ideal for fishing, as most days consisted of mid 80’s with clear skies and a very hot sun. However, despite the weather, the fish were still active and very aggressive. The majority of Smallmouth seemed to be sitting on their beds and hitting on whatever flies managed to come their way. What seemed to work best for the Smallies where the occasional Boogle Bug, Pike Snakes, and Clouser Minnows. The Clouser Minnow was by far the most productive fly on the trip, catching everything from large amounts of small snake Northern Pike to numerous 14-17 inch Smallmouths. The Second most productive fly of the trip was a red and white Pike Snake. 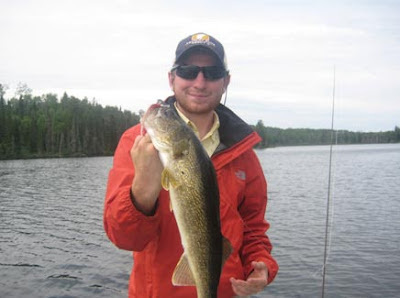 This Pike Snake landed me countless amounts of small Pike, some Smallmouth Bass, and a 23-inch Walleye. I caught this Walleye off a deep weed edge while slowing striping in the red and white Pike Snake. This Pike Snake also triggered many Northern to strike at the boat, so a makeshift figure 8 pattern seemed to get the job done. 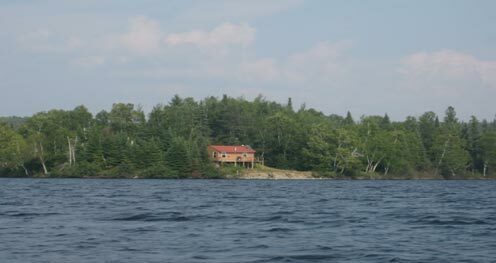 In the end Little Women Lake exceeded its expectation of phenomenal fishing and produced some very memorable fish. Thanks to everyone at Canada North Lodge for making this trip possible. Also thanks to my other 5 bunk mates on the trip. Beside from the barbed hook accidents and hot oil injuries we still managed to kill it out on the water.